You have a huge range of widths to choose from when making a ski purchase, from 60mm racing skis to 130mm big-mountain sleds designed for extreme places like Alaska. After years of trending ever-wider, we have seen the market level off over the past couple seasons in terms of ski waist width. That being said, the 2018-2019 models are almost unrecognizable compared to even 15 years ago. Below we examine the factors that play into your ski buying decision, including a look at width-related ski categories, new technologies that are helping make wide skis better for all-mountain use, and the importance of location and ability. Shaped skis have been around for a number of years, and their hourglass appearance is prominent on downhill models. Reflecting the variable width silhouette, there are three common points of measurement: at the tip (the shovel or most often the widest part of the ski), the middle (waist), and the bottom (tail). Ski dimensions are measured in millimeters and often include three numbers in the following format: 128-98-118mm (tip-waist-tail). The most important number for the majority of skiers is the middle number, also referred to as waist or width underfoot, and this what many people use to analyze ski width. Generally, a narrow ski excels in turn initiation and carving, and therefore is used for racing and standard use on hardpack. They are also easier to handle for beginners still putting together the basics on balance and edging. However, these skis immediately sink under the surface in powder and require a lot of effort to keep the ski tips up. Wide skis, on the other hand, have more surface area and therefore provide more flotation (think snowshoes as an example). This means that they perform great in powder, but take more effort to turn and are less stable and sloppier on groomers. All-mountain skis fall somewhere in the middle as the most versatile type of ski that, at least in theory, can handle most conditions reasonably well. In a perfect world, you would have a few pairs of skis in your quiver: a good narrow ski for carving on hardpack, a wide ski for those beautiful powder days, and a nice all-rounder for variable conditions and terrain. Many of us don’t have that luxury, however, so it’s important to dial in a ski width that will perform best throughout the season. As we mentioned above, the ski industry trended wider for a number of years. Why the changes? Ski manufacturers put a lot of effort into making their wide skis friendlier on groomers improving carving ability, edge control, and stability. For example, Rossignol’s very popular 7 Series line is in some ways defined by its Air Tip technology: a honeycomb-style insert in the tips of the skis that lightens them up considerably (Rossignol claimed by 20 to 30%). This is great for powder, where it’s easier to keep your ski tips up, not to mention less carrying weight when they are on your back. But it also pays off at the resort when you can take a traditional wide ski like the Rossignol Sky 7 HD at 98mm and easily flick it around curves. 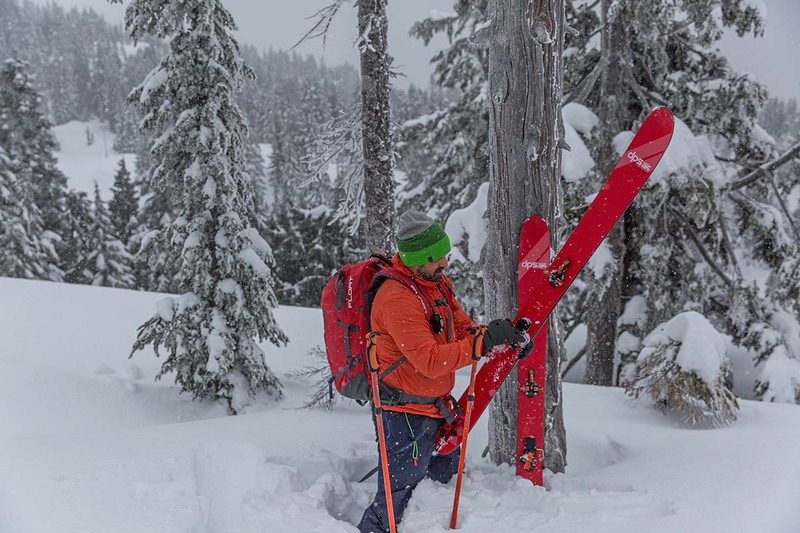 Throughout the industry, reducing the swing weight of a ski has become a high priority in delivering all-mountain versatility to these wider models. In addition to drops in weight, edge control on wide skis has improved substantially over the years. Many older skis had simple profiles that consisted of traditional camber tip to tail, which means that the middle of the ski was bowed or raised up with contact points at the top and bottom of the ski. Then rocker, or reverse camber, was developed to keep the tips and tails of powder skis out of the deep snow. People soon realized that skiing with rocker on hardpack helped with maneuverability and reduced the tendency to catch an edge in a turn. And by using a milder form of rocker—meaning a smaller percentage of the tip and/or tail of the ski is raised off the ground—issues with either end flapping at high speed on groomers have been eliminated in most all-mountain models. Hence the evolution of rocker/camber, which includes the best of both ski types and one of the reasons why wider skis have become much more versatile. Many all-mountain skis in 2018-2019 are relatively wide and have a rocker/camber profile with mild rocker at the tip (and sometimes at the tail) for flotation in soft snow and camber underfoot for edge control and turn initiation. The result is that wide skis now have much greater power and turn more easily than they once did. 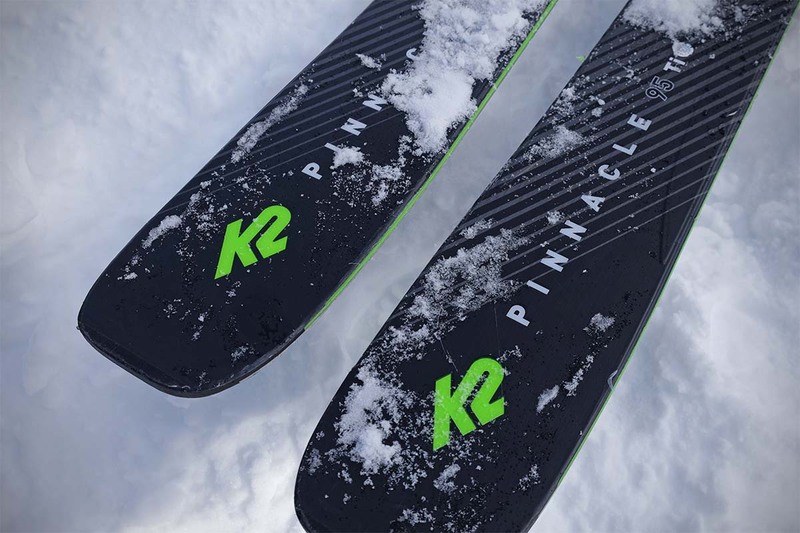 Combine this with lighter overall weights and the incorporation of advanced materials—including carbon fiber—that stiffen up the skis for a more responsive ride, and the 90mm to 100mm width range has transitioned from being limited to powder skis to now having true all-mountain capabilities. As you can see, there are huge variations in annual snowfall around North America. It’s worth noting that all snow in not created equal: Washington State, for example, gets more snow than Colorado but the moderate temperatures and high annual rainfall make for conditions that can vary from light and powdery to wet and heavy. Both Colorado and Utah have fantastic snow: they stay cold during the winter and the air is dry, so less snow goes a lot further in creating great conditions. And the final lesson from this chart: we should all go to Alaska to ski! The bottom line is that where you ski should dictate the width of your ski. If you live on the East Coast of the United States, unfortunately you can expect very few powder days and therefore a narrower ski designed for hardpack (80mm to 90mm waist) will suit you best. If you live in Bellingham, Washington, and Mt. 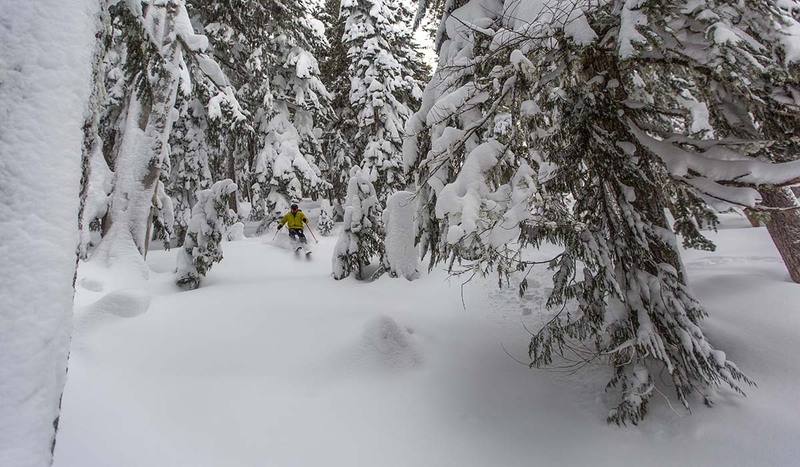 Baker is your home resort, you definitely want to buy at the wide end of the ski spectrum (100m+) as you can expect a high percentage of powder days. Location matters, but so does the parts of the resort you will end up skiing most. Even beginner skiers in snow-heavy places like Colorado and Utah will spend the vast majority of their time on groomed runs, and therefore a narrower ski is best. Intermediate and advanced will be pushing the boundaries more, both literally and figuratively, and a wider ski makes the most sense. Experienced skiers also will be able to control their skis better, and therefore can take on a wider and stiffer ski that would be challenging for beginners. To help bring everything full circle, we’ve created our own criteria for ski width selection below. Of course, the specific model you choose matters in the equation, but we feel it’s a good general picture of where things stand in 2018-2019. If you only plan on buying one ski and are an intermediate to advanced skier, we think that the true sweet spot for all-mountain use is the 88mm to 100mm range. The skis will be nimble enough to carve but wide enough to get some float in the deep stuff. Groomer skiers and East Coasters should look in the 70mm to 90mm range, and West Coasters in the 85mm to 100mm range. If you’re looking to get off-piste in the deep snow, you can start at 105mm and get all the way up to 130mm. If you are still looking for that perfect ski for this season, below are our top selections from the various categories. For even more picks, see our full articles on the best skis for beginners, all-mountain skis and backcountry skis.